She walked into the store determined to buy something. If it was purple or pink or sparkly, in her mind, it had her name on it. 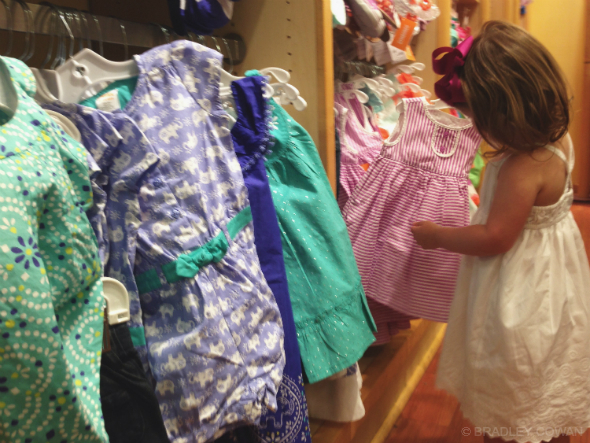 She held up dresses next to her two year old frame and she ran her chubby fingers through the racks and over the endless accessories of ribbons and bows while her eyes bounced from one corner to the next not sure where to land like a pinball sprung loose in a machine of excitement. 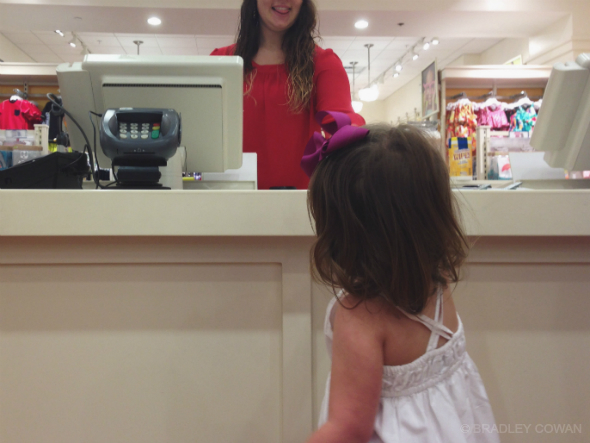 Her mother and I watched as she carefully selected an item before putting it back in exchange for another. We watched our baby, who somewhere along the way morphed into this little girl, walk around the store commenting on each option available and we smiled along with her and laughed at her verbal musings that only parents tend to do and when she finally decided which new thing it was she wanted to bring home with us, we seized the moment to teach her the lesson we came to learn. It wasn’t but a few days prior that a certain little someone walked out of a store with a pack of pink gum hidden in her tiny palm. A pack of pink gum warm from her grip that she presented to her mother once under the glow of the parking lot lights revealing her grocery store souvenir with the obvious declaration of “it’s pink!” and it was indeed. It was also not paid for. She walked back into the store, ushered by her mother’s maternal sense of conscious, and apologized for her mistake and the manager accepted her sweet sorry delivered with a slight nod of her chin then smiled in return while some other customer mumbled how cute our little girl was. In fear this lesson wasn’t perfectly clear in that moment, no doubt as a consequence of a toddler frame of mind, we took her shopping several days later and stressed the importance of paying for things we want before we leave the store with them. Once she committed to a set of three bracelets in various shades of plum, her mother handed her the paper withdrawn from her porcelain elephant bank that sits high on her dresser that would allow her to make this purchase. We stepped back and watched her walk up to the register and lay the merchandise on the counter, we watched as she waited for her total and we watched as she handed over the cash in exchange for the bracelets. 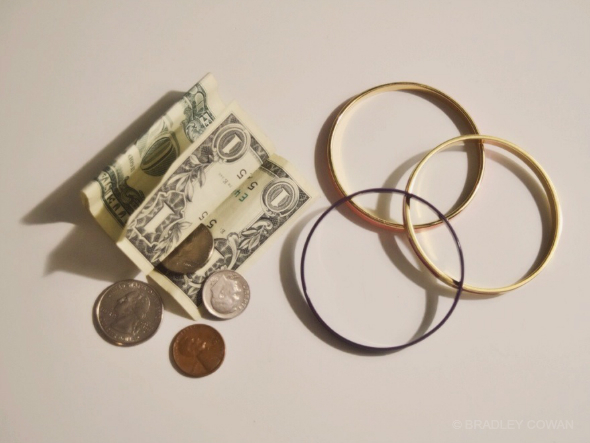 We watched as she grew up before our eyes in just a matter of minutes and as she turned around to look at us with a forearm full of bangles and a face full of pride to hand us the change leftover from her first transaction, we encouraged her to keep it… both the change and the lesson learned. Good job, taking the time to teach her a lesson about money and value, instead of just scolding her for taking something from the store, as I'm sure there are parents who do this. Thanks, Lisa. Parenting is hard.